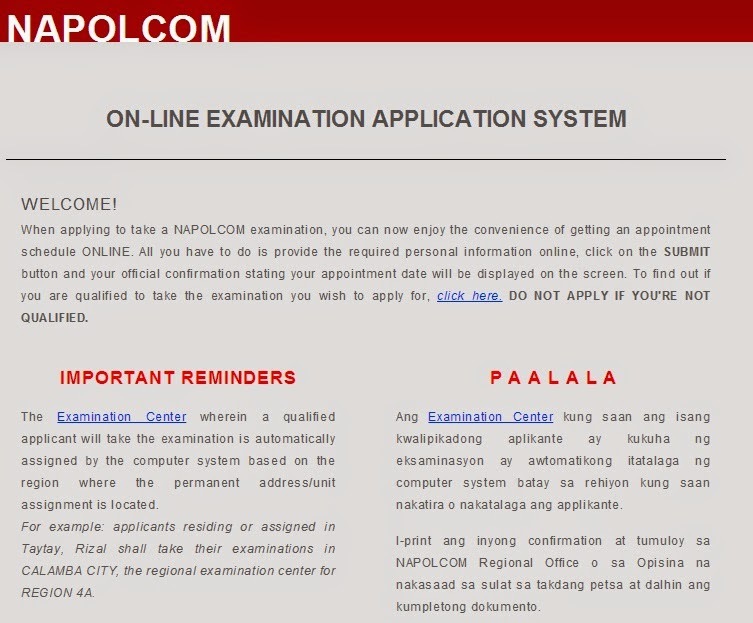 The National Police Commission (NAPOLCOM) Online Examination Scheduling System (OLEASS) for November 9, 2014 promotional exam is now available today, August 18 until Friday, August 22 to accept online applications. The system will be activated around 12:00noon today. To use OLEASS, visit www.napolcom-oleass.com or view here. NAPOLCOM Vice-Chairman and Executive Officer Eduardo U. Escueta said that acceptance of applications shall be on a ‘first come, first-served’ basis and, upon due notice, may be stopped even ahead of the deadline. “The examination center where the applicant shall take the exam is automatically assigned by the computer system based on the home address or unit of assignment provided by the applicant,” Escueta said. NAPOLCOM advised that On-line Scheduling for Region 5 Applicants (Legaspi City Examination Center) is suspended. Please proceed to NAPOLCOM Regional Office 5, Regional Government Center, Rawis, Legaspi City on September 1-30, 2014 to file your applications. Enhanced OLEASS was implemented to systematizes the scheduling of the processing of exam applications at the NAPOLCOM NCR Office and the other 16 regional offices nationwide. The period of filing of application is from September 1 – 30, 2014. The coverage for PNP Promotional Examinations include general information, police administration and operations, and police customs and traditions/values and ethical standards. The NAPOLCOM advised through Memorandum Circular No. 2013-007 last October 30, 2013 to deter examinees from committing any form of cheating.